Thanksgiving, or Thanksgiving Day, is a traditional North American holiday. On this day people express gratitude to God for his blessings and give thanks to dear ones for their love & support. Thanksgiving Day brings a perfect time for the families and friends to gather and inspire all of them to give thanks to the the lord for everything that he has done which is the very spirit of today’s thanksgiving celebrations. Nowsaday, Thanksgiving is celebrated on the second Monday of October in Canada and on the fourth Thursday of November in the United States. The legendary pilgrims, crossed the Atlantic in the year 1620 in Mayflower-A 17th Century sailing vessel. After a sea journey for 66 days, the pilgrims reached Plymouth rock, Massachusetts on December 11th 1620. In the spring of 1621, Squanto, a native Indian taught the pilgrims to survive by growing food like corn, beans and pumpkins which helped all of them survive. In the summer of 1621, owing to severe drought, pilgrims called for a day of fasting and prayer to please God and ask for a bountiful harvest in the coming season. God answered their prayers and it rained at the end of the day which saved the corn crops. In the autumn of 1621, they held a grand celebration where people were invited including Indians. The grand feast was organized to thank god for his favors. The dinner is popularly known as “The first thanksgiving feast” which its food included, ducks, turkeys, geese, swan and venison, fish, berries, watercress, lobster, dried fruit, clams, and plums. The feast continued for three days. It was accompanied by lots of dancing and merry-making. The feast was not repeated for the next few years until President Lincoln proclaimed last Thursday in November of thanksgiving in the year 1863. The first Thanksgiving Day Parade was held in 1924 was called the ‘Macy’s Christmas Day Parade’, despite the fact that it took place on a Thanksgiving Day. It took three years to actually re-name it as ‘Macy’s Thanksgiving Day Parade’ in 1927. American parades actually are an extension to the European tradition. In the 1920’s, many store employees of Macy’s department were second generation immigrants and were proud of their new American heritage. They wanted to introduce their beloved European tradition to an American Holiday and so they marched from 145 Street down to 34th Street dressed in fancy costumes such as clowns, cowboys, knights and sheiks. There were 25 live animals in their parade that they borrowed from the Central Park Zoo along with floats and professional bands. The parade was an instant hit and they attracted an audience of about over a quarter of a million people. Large balloons were introduced for the first time in the shape of Felix the Cat. There was a tradition about releasing the balloons that would float for days and the lucky finders could claim a prize for the balloons but this custom is now extinct. 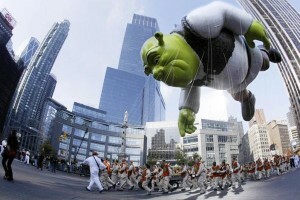 Children simply love Macy’s Thanksgiving Parade. Parade continued to grown in 1930s and crowd of over 1 million people lined the routes of the Parade by 1934. New balloons were introduced in the shape of Walt Disney characters and there were radio shows telling all about the ceremony and Santa’s arrival at 34th Street.